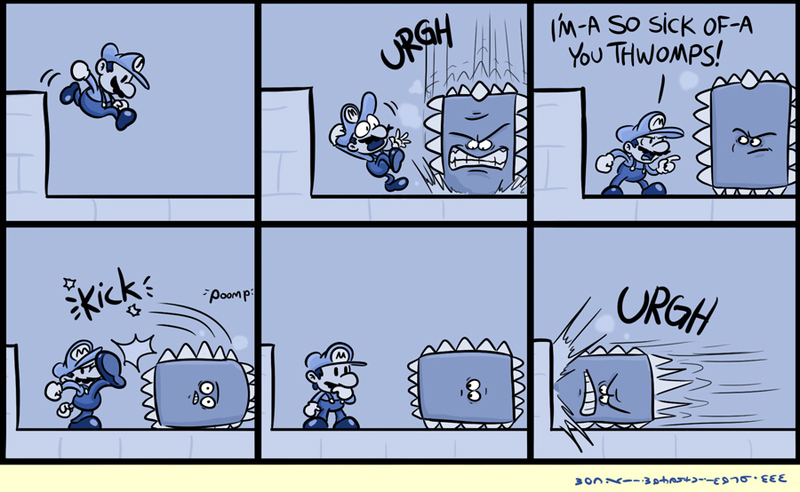 Okay, I had to get one more Thwomp comic out there. Having a character being flattened by an enormous (sometimes spiked) slab of rock never ceases to amuse me, and this one has a bit of hubris mixed in for good nature. No more Thwomps for awhile, though, unless I decide to put up a rather PG-13 one I concocted last year (and I won’t). A few things to go over today. This Thursday, my wife and I will be hitting the road for a Thanksgiving vacation, so there’ll be no new comics next week. However, because I like you guys, I’m still putting up Friday’s comic, but it’ll be up this Thursday afternoon. In the meantime, I’ll keep an eye on updating the Tadpole Treble Kickstarter from the hotel. It’s going well–the campaign isn’t even halfway over and we’ve already hit over 2/3rds of our goal! Keep spreading the good word.